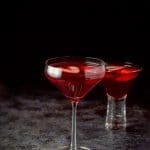 I recently posted another Valentine’s Day cocktail called the woo woo. My sister had always raved about the taste and after I made it, I thought it was as delicious as she stated. But then I tried this cocktail and, in my opinion, it is even better than the woo woo! What makes it so good? The combination of the three ingredients. I didn’t add any extra sugar, because it doesn’t need it. It’s perfect as is. The sweetness of the coconut rum and peach schnapps balanced with the tart cranberry juice makes this cocktail as sweet as I want a cocktail to be! Fill a cocktail shaker halfway with ice. After measuring out each ingredient, pour it into the shaker. For the garnish, take a strawberry, cut it in 4 thin slices vertically that accentuate the fruit’s heart shape and set aside. If need be, trim some of the strawberry to round the top so it truly looks like a Valentine’s heart. 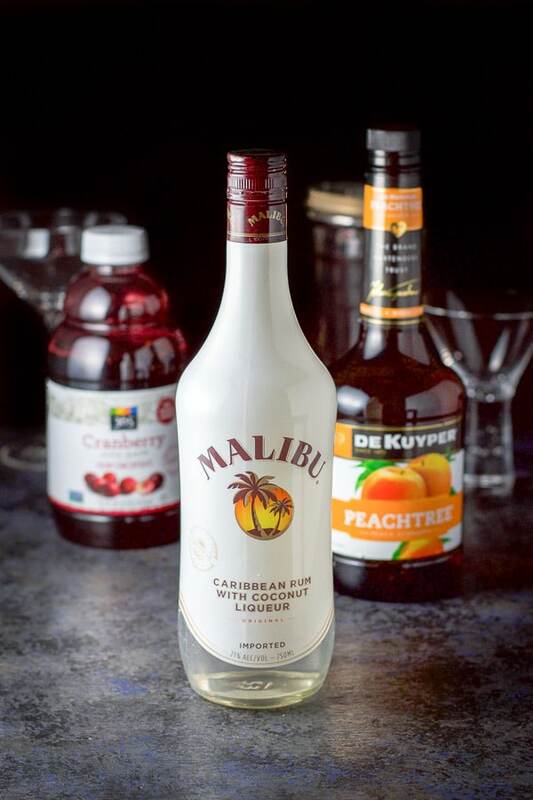 Gather the ingredients – coconut rum, peach schnapps and cranberry juice. Cap shaker and shake for 20 seconds and divide the love martini between two glasses. The vertical view of the love martini. 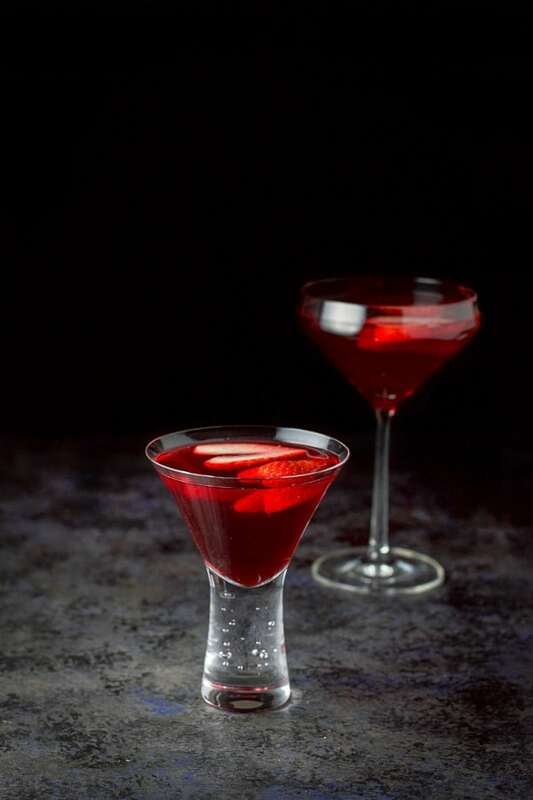 Doesn’t it look like the perfect cocktail to serve for Valentine’s day? It’s a triple threat drink – beautiful, delicious and easy. 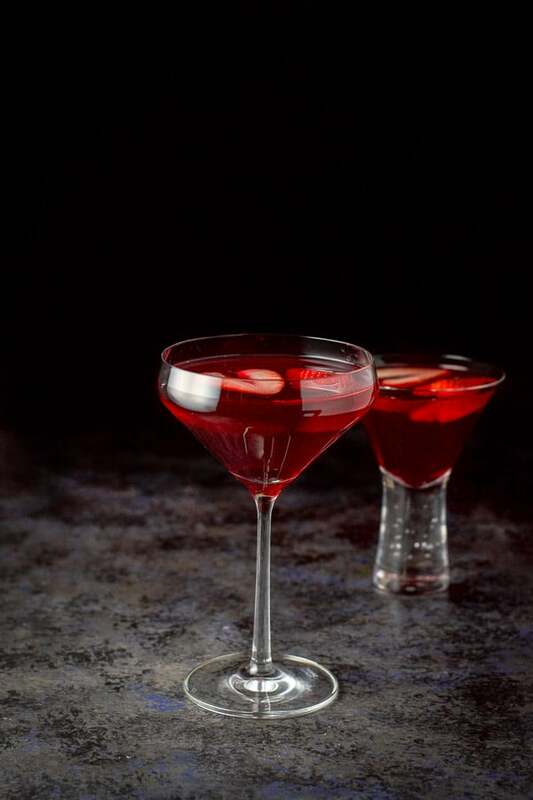 I hope you enjoyed this love martini recipe! 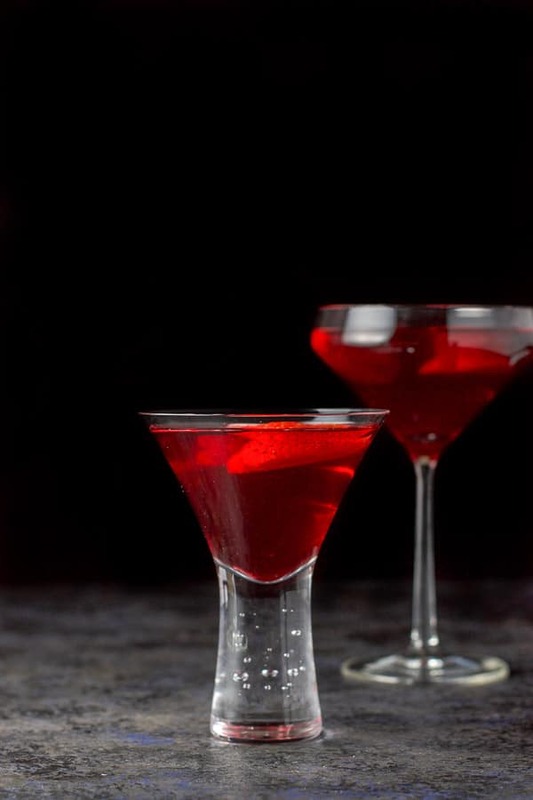 What is your favorite red cocktail? Leave me a comment as I’d love to know. 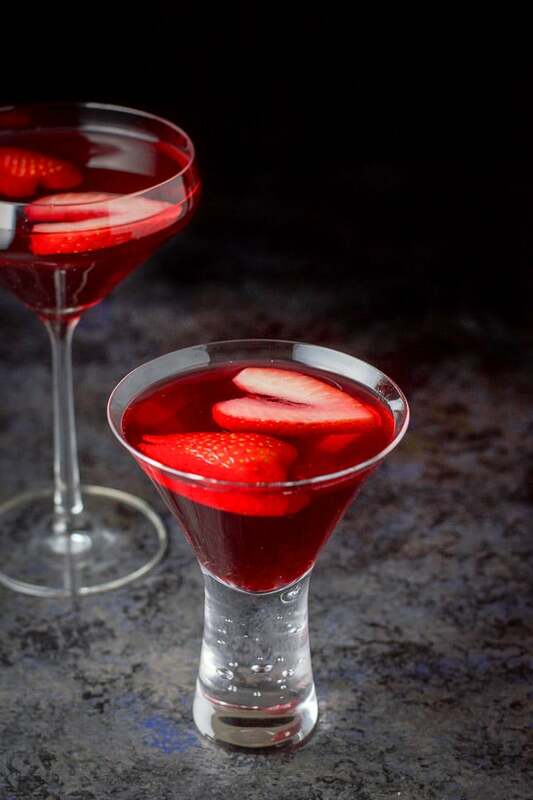 If you’ve tried this Love Martini recipe, I’d love the know what you thought about it in the comments below. I love hearing from you! You can also FOLLOW ME on FACEBOOK, TWITTER, INSTAGRAM and PINTEREST to see more of my delicious food and delightful cocktails! With only three ingredients, this recipe is delicious and easy to make. The color makes it perfect for Valentine's day! 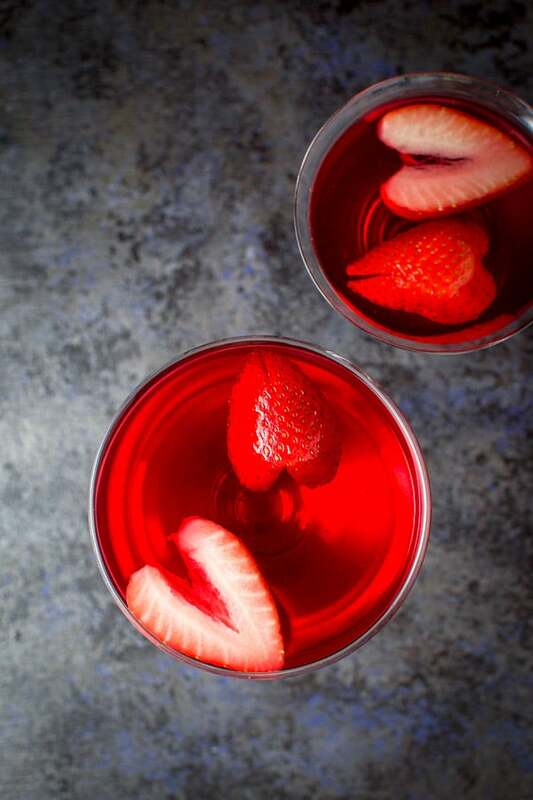 What a fun cocktail to celebrate Valentine’s Day! That color is just so bold and vibrant! Thanks Kristina. I’m loving these red cocktails. Yummy and so pretty too for the holidays. What a beautiful little drink, and perfect for this time of year! Thanks so much Katie! Cheers! 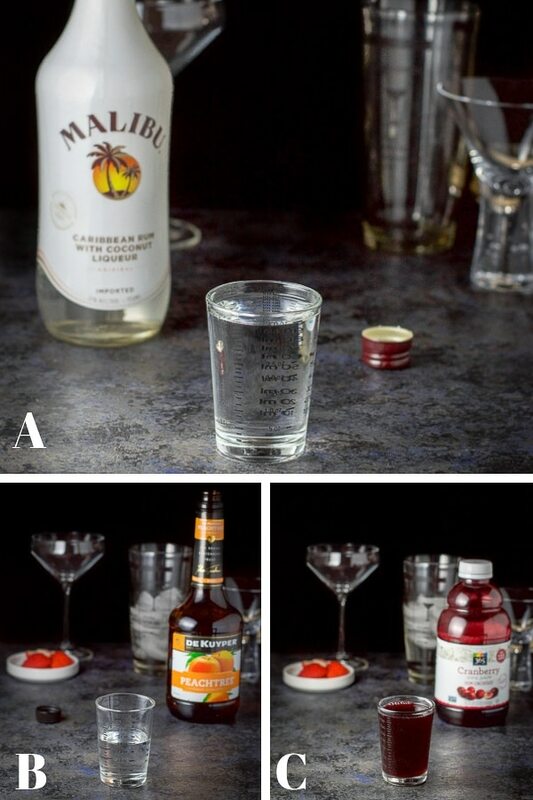 Such a fun Valentine’s Day drink! Cheers! Definitely trying this for our valentines day party. Thank you Robert! I hope you enjoy the cocktail! It’s so delicious! What a beautiful cocktail! And you make it look so easy to mix. Thanks Chris! I appreciate it!